It’s important to select the correct bot settings to earn more profits and to minimize the risks while trading with RevenueBot. 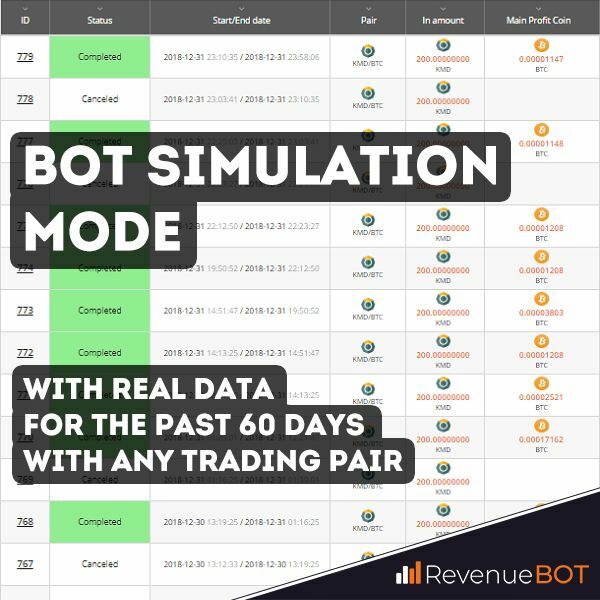 In order to choose optimal settings, we’ve developed a bot simulation mode to make it possible to see the way a bot would have traded using the real data for the previous 60 days, with any of the trading pairs. Try different bot settings and see the way it would have traded using real volatility analysis with a virtual deposit. Creating a bot in simulation mode. In order to activate a bot in simulation mode, you need to select the “SIMULATE BOT TRADING BEHAVIOUR (FAKE TRADING MODE)” checkbox when creating/editing it. Simulation bot creation process is the same as creating a usual bot. For easier identification, the bot with an active simulation mode will be given a different color (light pink) in the bots menu table. Starting a bot in simulation mode. Starting a bot in simulation mode is the same as starting a usual bot. You should click the Start icon in the Actions column. You cannot stop the bot in simulation mode manually. It will stop automatically as soon as the simulation is finished. Statistics of a bot in simulation mode. Statistics of the simulated bot are available in Trade Statistics (1). Click on the bot that you would like to review the cycle statistics for. It should be mentioned that the processing of the simulation for the last 60 days takes some time (5-10 minutes). The process can take up to 1 hour if you enabled the auto switching of trading pair function (according to the volatility analyzer results). It’s not necessary to wait until the whole simulation process is completed to see its result. The first bot operation cycles should appear shortly and will continue to be added as the processing continues. The bot in a simulation mode is marked with the status: “Running”, state: “Simulate” as long as the processing of 60 days data is going. When it’s completed, the bot is given the status: “Stopped”, state: “Normal”. All the cycles the bot would have accomplished are now available for review. Therefore, applying different settings and running them on real past schedules may help you choose optimal settings for bot creation. various settings for bot delays do not work in simulation mode.